Franson Squeezed Out of Toronto? | Five Minutes For Fighting Five Minutes For Fighting: Franson Squeezed Out of Toronto? 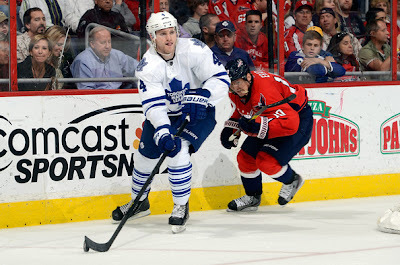 Franson trade speculation will heat up. Leafs would like to keep him, but $ is too much. Prospect and draft pick fair return? Based on the contracts other young defencemen have received this summer, including Slava Voynov, Kevin Shattenkirk, and Travis Hamonic, Franson and his agent are probably looking at a deal around $4 million a season. The Leafs, however, only have slightly more than $6 million in cap space (maybe closer to $7.5 million if Korbinian Holzer and Trevor Smith start the year with the Marlies), and still have to sign Nazem Kadri and Mark Fraser (who is going to arbitration and will get a deal the Leafs can't walk away from). All of a sudden the little deals Nonis has made this summer, like re-signing Colton Orr and Frazer McLaren for a combined $1.625 million, and retaining $500,000 in the Jonathan Bernier trade, are coming back to haunt the Leafs GM. Without those three moves, the Leafs would have closer to $9.625 million to re-sign Kadri, Fraser, and Franson. Even if both Kadri and Franson ended up with $4 million deals, there would still be enough money for Fraser. Furthermore, buying out the team's best centre and replacing him with an inferior pivot, rather than letting Tyler Bozak walk and buying out the redundant John-Michael Liles, cost the Leafs another $2.575 million in badly needed cap space. Even without sending players to the minors, the Leafs should have closer to $11 million in cap space. But they don't. The Leafs may now be forced into losing one of their precious few capable defencemen. However, exploring a Franson trade this off-season wouldn't have been the worst idea after his breakout campaign. He was a third-pairing defenceman for most of the season and although he racked up huge points at even strength, they were probably unsustainable amounts. Sure, he was great on the power play, and has a way of getting his shot through traffic and on net in a way Dion Phaneuf never can, but giving out big money deals to an offense-first, third-pairing defenceman isn't the wisest use of cap space. If the right deal was there, a trade could have been a classic sell-high move. Franson did play a bigger role in the playoffs after injuries forced Randy Carlyle into making smarter roster decisions, so the potential for top-four play existed. Plus, big defencemen with big shots don't grow on trees. So dealing Franson, even by choice, was always going to be risky. But the Leafs aren't potentially dealing Franson because they have scoured the trade market and found a deal that makes the team better. They are being forced into it because Nonis bungled away gobs of cap space, most often wasting it on inferior players. Sure, blaming big deals to David Clarkson and Bozak is warranted, but those aren't the real reason Franson might be moving on from Toronto. A thousand paper cuts killed the Leafs' cap space, slowly bleeding it to death. Little moves that, in isolation, make no real difference add up to substantial dead cap space. Dead cap space kills teams, and Cody Franson might just be the latest casualty.